Help us by clicking a link and adding any item to your cart at Amazon within 24 hours, and we will earn a small referral commission. 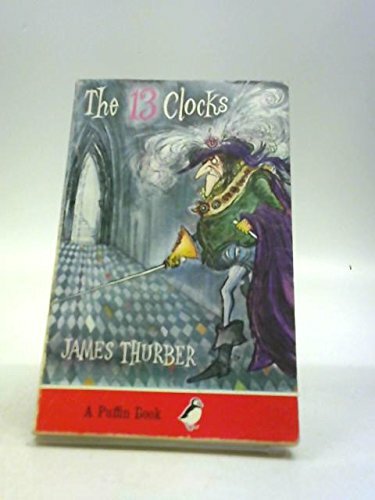 Below are search results for 13 Clocks by James Thurber at Amazon. You can visit Amazon to customize this search. Below are search results for 13 Clocks at Alibris. You can visit Alibris to customize this search. 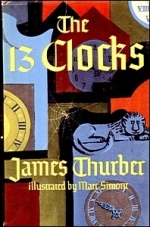 Below are search results for 13 Clocks by James Thurber at AbeBooks. You can visit AbeBooks to customize this search. Below are search results for 13 Clocks audiobooks at iTunes. Browse iTunes to customize this search. 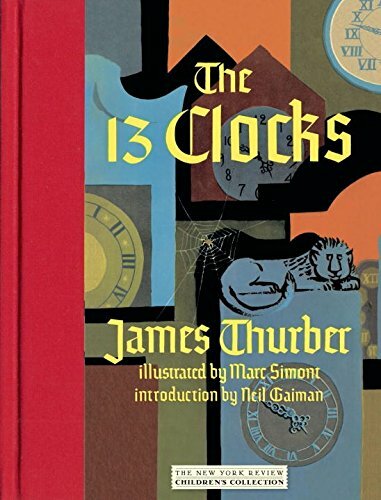 The Thirteen Clocks is James Thurber's enduring story of life in a castle where time stands still on every clock at 10 minutes to five. The Duke of the castle ignores time and pays no attention to temperature either. He is a wicked Duke who has hands cold enough to choke a bull. The only warmth he understands is the warm hands of Princess Saralinda, his fair niece, whom he cherishes and protects from suitors. In a comic and poetic way, this story makes us all want to love a Princess and to be a Prince. What's more, we want the 13 castle clocks to whir and tick and tell us that the time is NOW. Below are search results for 13 Clocks ebooks at Apple Books. The hands of all thirteen clocks stand still in the gloomy castle on a lonely hill where a wicked Duke lives with his niece, the beautiful Princess Saralinda. The Duke fancies he has frozen time, for he is afraid that one day a Prince may come and win away the hand of the Princess—the only warm hand in the castle. To thwart that fate, he sets impossible tasks for Saralinda’s suitors. But when the bold Prince Zorn of Zorna arrives, disguised as a wandering minstrel, and helped by the enigmatic Golux, the cold Duke may at last have met his match. Since it was first published in 1950, James Thurber’s sublimely whimsical fairy tale of love forestalled but ultimately fulfilled has delighted readers of all ages. It is published here with Marc Simont’s enchanting, full-color illustrations from the first edition. Sinister hooded riders are terrorizing farmers at night, and most of the farmers are reluctant to talk. Meanwhile, a man named Blake makes a generous donation to the Riverview orphan's camp and offers to buy their land, but Penny suspects that he is somehow trying to cheat the orphans. The Inspector Rebecca Mayfield mysteries, also called the “O’Clock” mysteries (for obvious reasons, as you’ll see), actually began with a Christmas novella, THE THIRTEENTH SANTA. In it, Rebecca first meets mystery man, Richie Amalfi, and the strange group of “Santas” he manages to lose in San Francisco. Trying to find them—and some Christmas cheer—brings more than a little danger to both him and Rebecca. The first full-length mystery, ONE O’CLOCK HUSTLE, has Richie accused of murder. Instead of fleeing, he runs straight to “by-the-book cop” Rebecca for help. And she learns that some rules are made to be broken. The final “hour” in this boxed set, TWO O’CLOCK HEIST, has Rebecca discovering that the only person willing and able to help her find a friend’s killer is the one man she most wants to avoid—Richie Amalfi. Readers love the Inspector Rebecca Mayfield mysteries, and hopefully you will as well. Begin with “one o’clock,” and you’ll find that the “hours” just seem to fly by. The Violet Strange Series is a collection of nine mysteries featuring Violet Strange, a debutante with a secret life as a sleuth. Anna Katharine Green (1846-1935) was one of the first writers of detective fiction in America and distinguished herself by writing well plotted, legally accurate stories. Green has been called "the mother of the detective novel". She is credited with shaping detective fiction into its classic form, and developing the series detective. 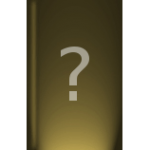 As journalist Kathy Hickman writes, Green "stamped the mystery genre with the distinctive features that would influence writers from Agatha Christie and Conan Doyle to contemporary authors of suspenseful "whodunits". In addition to creating elderly spinster and young female sleuths, Green's innovative plot devices included dead bodies in libraries, newspaper clippings as "clews", the coroner's inquest, and expert witnesses. When you nick yourself and bleed a bit, your body has a system to stop the bleeding and replace the cells that were damaged--but only the few damaged cells. Your body has an amazing system to 'know' when to make cells, not just to replace damaged cells but all sorts of cells throughout the body. The body also knows when not to make cells; otherwise, we'd all be similar to The Hulk. This system of turning on and turning off cell production is under the control of numerous genes. One of the sets of genes that helps maintain the proper amount of cell division is the RNF (RING-type zinc fingers). In this set are two tumor suppressor genes named BRCA (for breast cancer) 1 and 2. How can anyone describe this book? It isn't a parable, a fairy story, or a poem, but rather a mixture of all three. It is beautiful and it is comic. It is philosophical and it is cheery. What we suppose we are trying fumblingly to say is, in a word, that it is Thurber. There are only a few reasons why everybody has always wanted to read this kind of story: if you have always wanted to love a Princess; if you always wanted to be a Prince; if you always wanted the wicked Duke to be punished; or if you always wanted to live happily ever after. Too little of this kind of thing is going on in the world today. But all of it is going on valorously in The 13 Clocks. Another collection of blood soaked, gory, horrific stories centred on that most evocative of nights, Halloween. Here are manic people and pumpkins, savage spooks and nastiness by the ton, as only the Thirteen O'clock Press authors can conjure from their fevered imaginations... enjoy! Coming back from – that’s the point at which the authors in this varied and fascinating anthology take off in all directions. Zombies through to returning parents, coming back proves to mean many things to many people. Come back to Thirteen O’clock Publications’ premier authors and sample some dark, dark stories. Sci-fi fan or not, aliens hold a fascination for humans. The mystery of UFOs, the thought they may walk among us without us knowing, the thought they may be watching us all the time... these things ensure that we, as a race, are absorbed with thoughts of ‘aliens’, however they might show themselves. In giving Thirteen’s talented writers a theme like that, it was guaranteed that the stories which came in would cover every possible interpretation of the alien theme that you can imagine, and then some. Man has ever fought man in some way or another. From the earliest civilisations which sought to take the land of others, there have been wars. Within the overall conflict are the individual stories of heroism, cowardice and unexplained happenings. All are explored here by the talented Thirteen O'Clock authors who have taken this theme to their hearts and produced their fantastic stories. Join over 20 authors from around the world, some of the best working in the indie fiction scene today, as they ready themselves to divulge the terrifying prophesied truth that surrounds the topic of climate change and its effects on our fragile planet. ALL PROCEEDS will be donated to Greenpeace, so tell your friends, spread the word, and help us raise lots of money for this worthwhile cause. Doors are fascinating, from the normal house door, hiding its multitude of secrets from the neighbours, through the elegant crafted doors of high flying businesses in tower blocks, where who knows what wheeling-dealing goes on, to the solid ancient lost-in-antiquity doors of churches behind which are hundreds of years of prayers and confessions and acts that are beyond the imagination of the average churchgoer. Doors that say KEEP OUT and doors that invite you in. Countless thousands of them - all have their own reasons to be there and their own secrets to conceal. The authors responded to the call for contributions with an incredible collection of murder and mayhem, of bitterness and depravity and just about every other human emotion there is. Open the door and walk in… there are stories here to entertain and surprise you. The talented Thirteen O'clock writers have had a serious attempt at getting behind the painted smiles and revealing the true nature hidden behind the white face - death. "I could do with a little sleep," Mr. Parker yawned. "After a hard day at the office, your brand of night life is a bit too strenuous for me." Selecting a short-cut route to Riverview, Penny paid strict attention to the road, for the narrow pavement had been patched in many places. On either side of the highway stretched truck farms with row upon row of neatly staked tomatoes and other crops. Rounding a bend, Penny was startled to see tongues of flame brightening the horizon. A large wooden barn, situated in plain view, on a slight knoll, had caught fire and was burning rapidly. As she slammed on the brake, Mr. Parker aroused from light slumber. "Now what?" he mumbled drowsily. "Dad, unless I'm imagining things again, that barn is on fire!" "Let 'er burn," he mumbled, and then fully aroused, swung open the car door.